The Lake Tahoe Water Trail Map & Guide was developed to create a unique paddling opportunity and provide visitors with an ecologically sustainable alternative for recreating in this wonderful place. 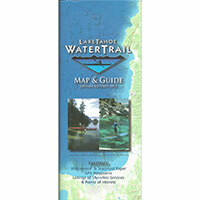 It is designed to help plan custom kayaking and SUP paddling adventures along the shores of Lake Tahoe. It can also be very useful to power boaters and anglers for navigating this large body of water. This map combines a highly detailed topographical map of the lake, including GPS coordinates and Lat/Long grids, with a detailed table of near-shore services around the lake. Color coded numbers on the map correspond to description lines in the information table to help in all phases of planning your paddling itinerary. Each description line provides necessary information about a specific site (phone numbers, reservation information, available amenities, etc.). The numbers are also color-coded to quickly identify types of sites (lodging, camping, restaurants, launch points, points of interest, etc. Open dimensions 24" x 37"